I started working for National Museums Scotland in July 2018 as the new Pelham-Clinton Entomology Research Fellow. I grew up in South Africa and my passions include biodiversity, conservation and mayflies, an amazing 300-million-year-old group that are among the oldest flying insects. My work takes me to some amazing places and my field expeditions have the main aim of biodiversity discovery, because we can’t save something if we don’t know it’s there. This time it was Madagascar, every biologist’s dream fieldwork destination. A 160-million-year-old island separated from any other land mass for 88 million years, what’s not to like? The level of unique species in this biodiversity hotspot is almost unimaginable and just about every animal group you can think of has an endemic relative living on this “micro-continent”. Mayflies are no exception, as I discovered at the end of this trip! 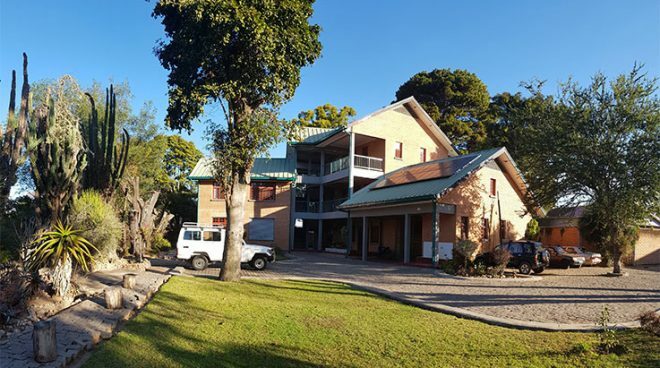 During the first week, we attended the GBIF funded AFRESH.IO (African FRESHwater Indian Ocean Islands) workshop at the Tsimbazaza Biodiversity Centre in the capital city, Antananarivo. We were a group of 22 researchers and students from Madagascar, Austria, Switzerland, South Africa, Mauritius and the UK, with the common goal of conserving river biodiversity in the Indian Ocean Islands. Freshwater covers only 0.3% of the earth’s surface, and yet holds one-tenth of all animal species. These numbers are absolutely mind-bending, especially considering how desperately we need freshwater to survive. and Dr Vere Ross-Gillespe (Groundtruth, South Africa). The Tsimbazaza Biodiversity Centre in Antananarivo. The outcomes of the workshop highlighted the need for biodiversity surveys and generating knowledge about freshwater species (macroinvertebrates and diatoms). 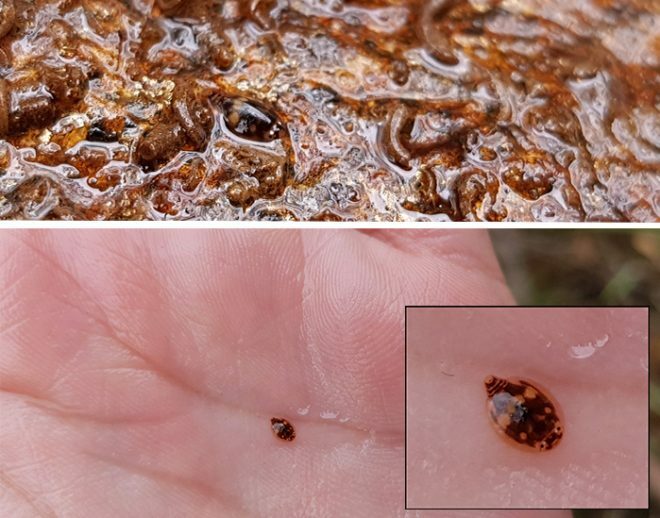 There are plans to create biomonitoring school programmes, where students collect river invertebrates and record their findings. This is a great approach as it will create awareness of the importance of freshwater, generate rough invertebrate distribution data and give an idea of river health around the country. All of the data is then made publicly available online. 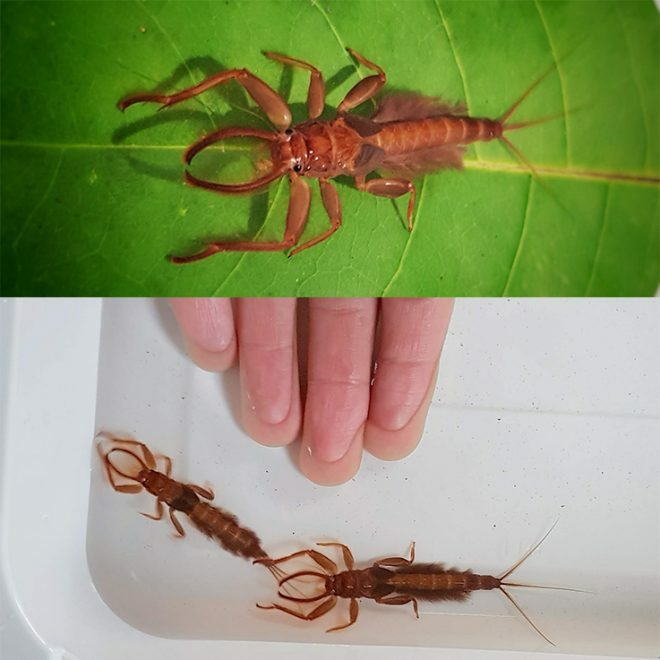 Of course, this is just a start as we still don’t know much about the river biodiversity in detail (species level), but this is a work in progress and we are currently working on project proposals and new methods for rapid species discovery! Students were shown how to take water chemistry, physical water properties, macroinvertebrate and diatom samples. They also identified the main invertebrate groups using field guides provided by Groundtruth. The results are available on the Groundtruth miniSASS map. One of my favourite findings from the field trip: one of the strangest looking mayflies that exists, a water spec mayfly (Prosopistoma), which was thought to be a crustacean for over 100 years! In the top photo you can see that the water spec is well camouflaged on the underside of a stone. After the workshop, eight of us travelled 60 miles north of the city (which took five hours with the terrible roads and traffic in Madagascar!) 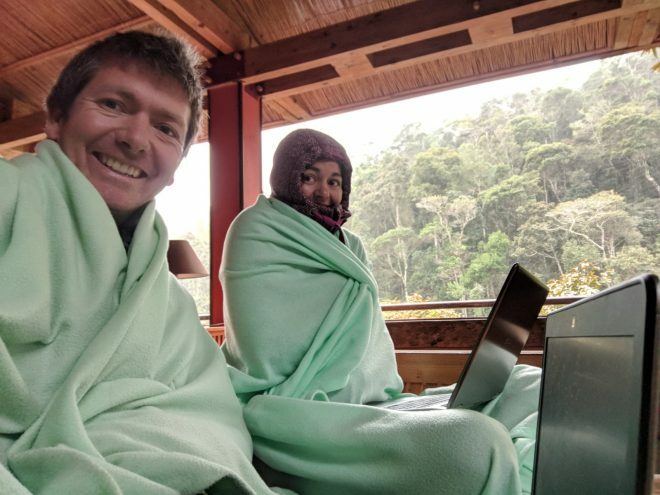 for fieldwork in the Eastern Highlands rainforest. Deforestation is a serious problem in Madagascar, with forests reduced to 30% of their original extent. It was a sobering experience as we drove past thousands of rice paddies and eroded hills with bushy eucalyptus trees that we all knew should be thick with lush, indigenous forest. These two photos were taken from the same footbridge at the edge of the rainforest. The top photo faces west, showing deforested land, and the bottom photo faces east, showing the edge of the forest with tall, indigenous trees.We arrived at our beautiful camp, with tents on stilts at the edge of the rainforest. And true to its name, it rained. A lot. It’s also winter in July, so a constant 10°C with 100% humidity means everything is always cold and always damp. It was quite the experience as our main dining area was an open deck and our tents were canvas, so we went without solid walls for a week! We set off into the forest with our nets, ambitions in-check because we were unsure of how pristine the conditions would be in the stream. We dipped our nets in, poured the contents into a tray and hunched over it in anticipation, knees soaked in the wet mud on the river bank. To our delight, we found a wealth of biodiversity in the sample, with a few good indicator species (pollution sensitive) that show that the river is healthy. Left: Me sampling stones in current. Right: a beautiful waterfall close to camp that is sacred to the villages nearby. No sampling is allowed on Tuesdays as the waterfall is used for religious activities. During our ventures through the forest, we were fortunate enough to see some of Madagascar’s finest in the wild, including three species of lemur: the nocturnal Sportive lemur, the Common Brown, and one of the world’s largest living lemurs, the critically endangered Diademed Sifaka lemur. 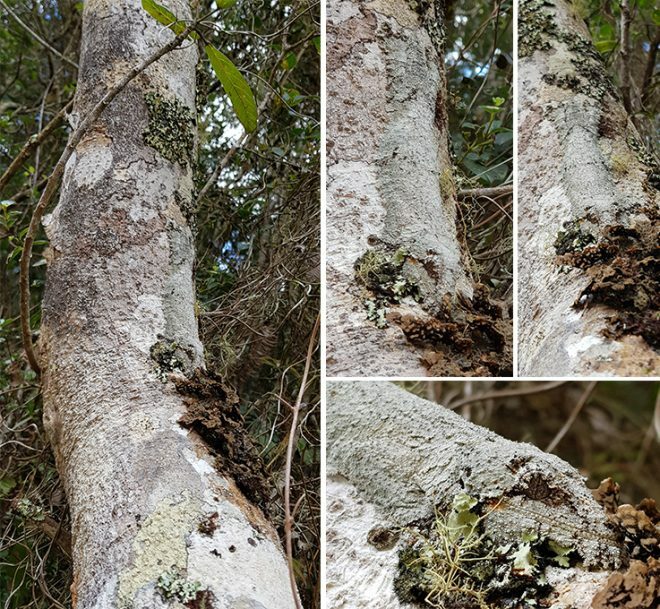 Although it was winter and the cold-blooded were not as active, we still managed to see some impressive chameleons, frogs, semi-slugs and a magnificently camouflaged leaf-tailed gecko (Uroplatus). 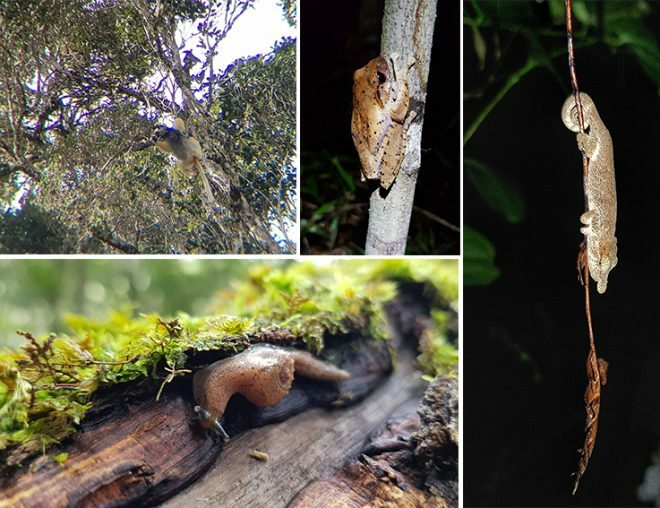 Clockwise from top left: Diademed Sifaka lemur, mantellid frog (Boophis), big-nose gecko, and a semi-slug that has warty lobes that cover its thin shell (probably Malagrion, Ben Rowson pers. comm.). It has been estimated that half of the known mayfly diversity in Africa occurs in (and only in) Madagascar, an estimated 200 species found on an island that makes up only 2% of Africa’s land area. Madagascar’s incredible biodiversity is under serious threat from human pressures, and an incredible amount of work is needed in order to conserve what is left. It is a daunting and overwhelming task. 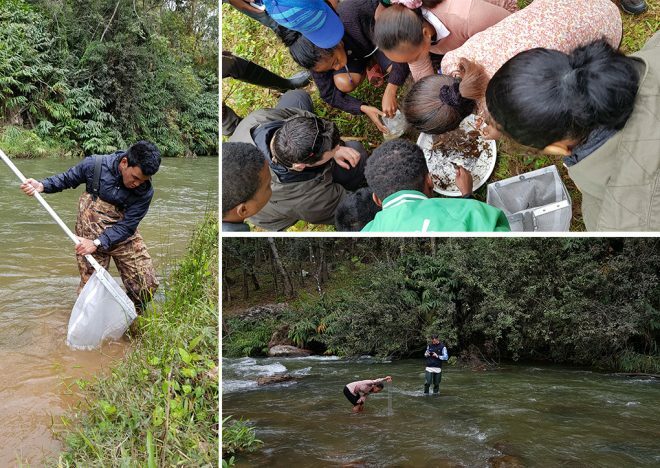 However, after working with the Malagasy students on this trip, we know that if other students/biologists/conservationists are even half as passionate, then there is hope for Madagascar’s river conservation. When is a snail not a snail? Is this the rarest fish in the world?